64 F A ll 2018 Practice l ink.com features typically as part of the group's overall income." The contract should also identify any restrictions on non-medical activities — for example, if you play in a band or own a coffee shop. Though it is usually clear that such compensation is your own, there may be restrictions on time or type of work allowed. 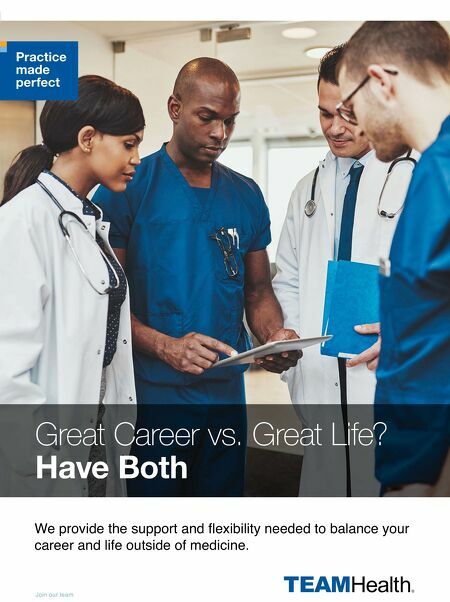 According to the ACP, "groups usually preclude physicians from performing outside services that will interfere with their ability to fully satisfy their practice obligations." Protect your future One of the most critical sections of your employment contract is the handling of malpractice insurance. This protects you against liabilities that may arise while you are acting on behalf of the hospital, practice group or academic institution. Coverage varies depending on the type of situation. A hospital or large practice may pay some or all of your malpractice insurance premiums, while a smaller group or practice may expect you cover your own. Your contract should define any limits or maximums on the policy, who is responsible for premiums, and any breakdown of coverage. T he type of policy is an important distinction; it will be either "occurrence based" or "claims made." In an occurrence- based policy, any incident that arose during the boundaries of your employment period is covered, regardless of when it is raised. In a claims-made policy, only incidents that are raised while you are an active employee are covered; anything raised after your termination date are not, even if they originate from service provided while you were an active employee. It's not uncommon that a patient raises a claim years — even decades — after you treated them, so with a claims-made policy, look for the inclusion of an extended reporting endorsement, more commonly known as tail insurance. This is offered by the malpractice insurance carrier as a way to extend a claims- made policy to include anything raised against you post-termination. "Be cognizant of what is covered in your contract; having tail insurance is non- negotiable," Khaiser says. "The number-one thing is to protect yourself and your license." Tail insurance is costly; employers may split the cost with you, usually by deducting your contribution directly from your paycheck. Sometimes the employer will offer an incentive plan, in which the cost to you decreases each year you remain with the practice. 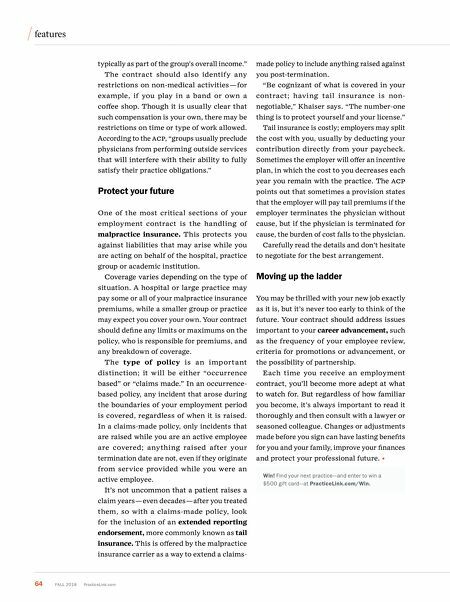 The ACP points out that sometimes a provision states that the employer will pay tail premiums if the employer terminates the physician without cause, but if the physician is terminated for cause, the burden of cost falls to the physician. Carefully read the details and don't hesitate to negotiate for the best arrangement. Moving up the ladder You may be thrilled with your new job exactly as it is, but it's never too early to think of the future. Your contract should address issues important to your career advancement, such as the frequency of your employee review, criteria for promotions or advancement, or the possibility of partnership. Each time you receive an employment contract, you'll become more adept at what to watch for. But regardless of how familiar you become, it's always important to read it thoroughly and then consult with a lawyer or seasoned colleague. Changes or adjustments made before you sign can have lasting benefits for you and your family, improve your finances and protect your professional future. Win! Find your next practice—and enter to win a $500 gift card—at PracticeLink.com/Win.